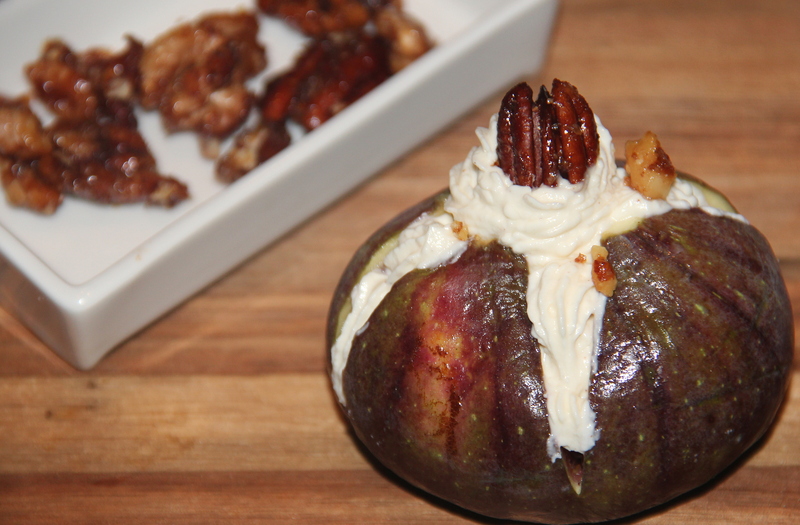 Fresh figs low fat dessert-here in this recipe figs are cut into blossoms filled with hung curd and topped with some glazed nuts. The hung curd tasted soo delicious trust me never felt cream/frosting would have tasted more better. The glazed nuts added crunchy bite. So when a dessert can be enjoyed in a healthy way and guilt free why say no? enjoy this guilt free dessert. Once thick curd is obtained-combine curd, vanilla, honey in a bowl and whisk until smooth and keep aside. Place nuts, honey in skillet on a medium heat for 4-6minutes or until the mixture foams, stirring occasionally. Spread on the baking sheet, separating slightly with fork, cool completely. 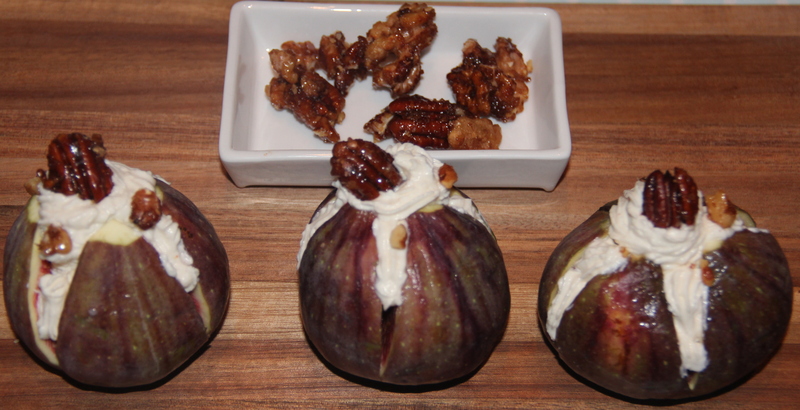 Cut off the pointed top of the figs, place it upright on a plate with siced tip at the top. Slice the fig in half without cutting through the bottom. Leave a little space intact so that the fig will hold togother as one piece. Slice across the fig again, perpendicular to the previous cut. Slightly pull apart. Fill the centre with hung curd mixture either using spoon/ use piping bag. Whipping cream/cream cheese can also be used for filling but that adds up some calorie to your diet. Posted on September 14, 2014, in Breakfast, Breakfast, Dessert, Indian, International and tagged Chitras healthy kitchen, drchdietfood, Figs dessert, Fresh fruit dessers, Guilt free figs dessert. Bookmark the permalink. 31 Comments. So pretty Chitra and fresh figs are so wonderful, love the creamy filling. I wish I had a fig tree. Oh my! Talk about a decadent treat!